Storey Publishing, LLC, 9781603425643, 224pp. 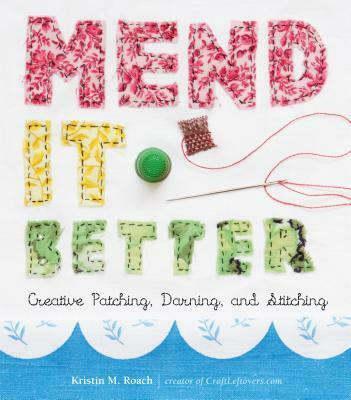 Kristin M. Roach, creator of the popular website Craft Leftovers, is the author of Mend It Better. She enjoys teaching art classes, organizing community art programs, and inspiring others to live creatively. Her designs have been featured in a variety of publications, including Interweave Knits, KnitScene, Craft, and the book Button It Up, by Susan Beal. Craft blogger Roach's first book is an excellent addition to any sewer's collection. Instead of presenting another plethora of patterns, she seeks to empower her readers by teaching the skills they'll need to mend nearly any piece of clothing, from ripped buttonholes to torn hems. While there's no substitute for learning in person, the publisher and author should be commended on creating a book with excellent, clear photographs that show, step by step, how to complete basic repairs. The chapter Stitch Smarts, which covers everything from the blind hem stitch to the little-known prick stitch, is particularly outstanding. Roach also presents a few patterns, most from other crafters, that provide inspiration towards more mending, less discarding of torn clothing. With the exception of the odd placement of two projects before instructions on the stitches required to make them, the book unfolds in an accessible manner; great layout (and lovely photos) provide eye candy. This is the rare sewing book that will be pulled off the shelf for reference again and again. Full color photos and illustrations, 13 patterns.